​Key Features: Blazing scarlet autumn foliage; Vivid orange / pink fruits persist into winter; excellent size & shape for small gardens. 'Red Cascade' is an excellent choice for small gardens or confined areas where space is at a premium. Not only is its habit appealing but it has so much to offer by way of brightly coloured leaves and vivid fruits meaning you will want to give it a predominate position where it can be easily viewed. 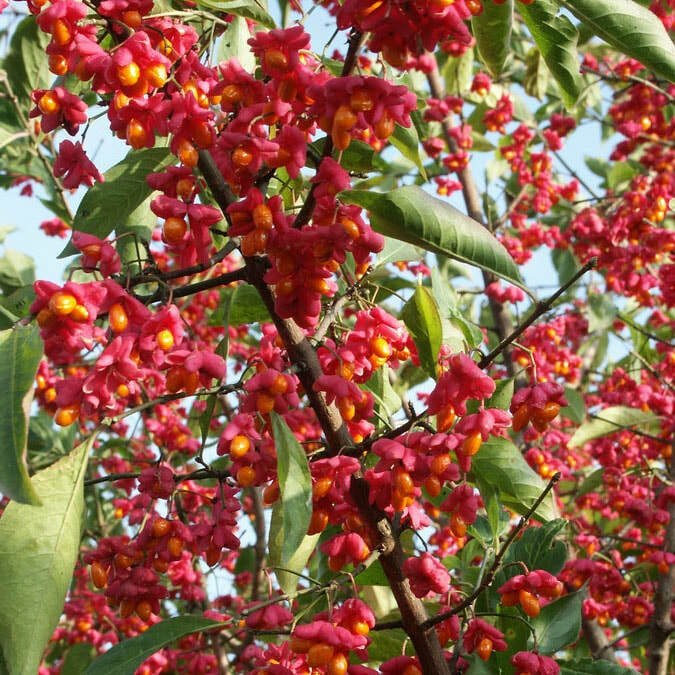 Leaves emerge bright green in spring and whilst the summer flowers may be relatively insignificant they do result in the most attractive rosy pink fruits which split open forming four winged lobes with a bright orange seed at the centre, spectacular! The fruits persist long after the leaves have displayed their glorious autumn colour and fallen. Indeed fruiting can prove so abundant that the naturally arching branches appear pendulous under the weight. Fully hardy in the UK, Euonymus europaeus 'Red Cascade' is a proven performer on our soils apart from waterlogged ground, so provide it with a reasonably sunny spot, with free draining soil of any kind and watch it prosper.